I'm getting my first Aussie. She's a red merle with blue eyes. Parents are registered with ASDR and the male is 15.5" female 15". Her name is Skylar. I'm getting her in a week and she will be almost 10 weeks. Any advice on the first few days bringing her home. First off, cute puppy! Aussies are a wonderful pet. Just be patient with her, especially during the first few days. Make sure she has plenty of chew toys and don't leave anything on the ground that she might choke on. Take her outside every time she's had something to eat or drink and make sure to reward her for going to the bathroom outside. Give her 1-2 hours at the min. of playtime outside and make sure to socialize early. Best wishes to you and little Skylar! ENJOY! On a more serious note, these pups are so smart start them early on obedience. I immediately stopped any play biting or chewing on anything other than toys or rawhides. If I could do anything differently I would have socialized Ellie earlier and more consistently. Aussie's can be very territorial and getting them comfortable with other dogs especially, is a must. Have fun with that little cutie! What a cute picture and name Skylar. Wish I could attached a pic of my puppies..
Aussies learn to understand human speech. Be sure everyone interacting with her uses the same words to achieve desired results. For example, when you take her outside to potty, use a simple phrase, such as, "go potty," (or whatever you choose), then praise her when she does. Everyone in the household should use that same phrase. She will soon learn what those words represent. Use that same technique for everything you want her to learn. She won't understand synonyms. Also, please don't teach her bad grammar, such as "lay down." It is "lie down." That just a pet peeve of mine. 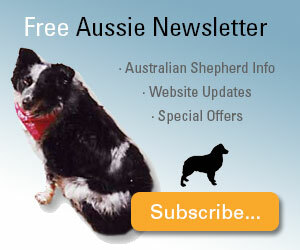 Aussies are classy dogs--they deserve our best efforts. She is a beautiful girl! so sweet! best of luck. we had a really rough couple of days when we first brought our girl home at 10 weeks old. get her a sturdy crate that is suitable for her size and can grow with her (midwest makes a good one with an adjustable divider). 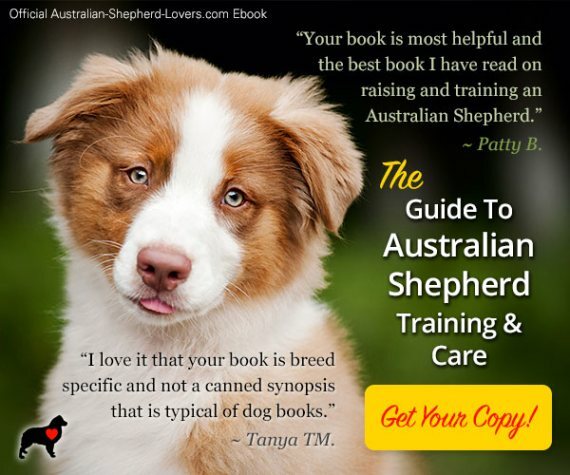 pick up The Puppy Primer by Patricia McConnell for ongoing training. 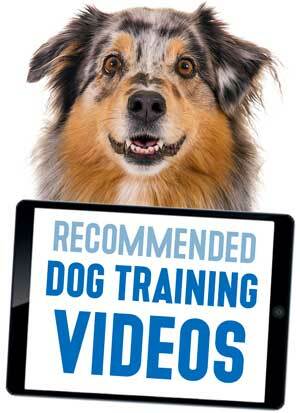 Positive training methods work best with this breed. Spend lots of time getting to know one another but set aside plenty of time for the sleepy pup to take plenty of breaks, otherwise they are prone to overarousal (which led to lots of jumping up an crazed nipping at clothing from ours). Try to get on a good schedule with her as soon as you can so she has some structure. Ours was incredibly slow to bond with us but once she did she became our shadow and is just the best, so be patient. they are wonderful pups. First of all, Skylar is beyond cute! I especially suggest love, determination, patience, exercise and socialization. Those may sound obvious but they are so important with this breed in general. Our 16 month old Aussie was a real handful when she was younger (she’s a dream now). We got her at 10 weeks and at about 11-12 weeks old she really started trying my patience. I would sit at the kitchen table and cry to my husband that she didn't like me, I was a failure etc. I've had other puppies/dogs so it wasn't just a canine phase I wasn't aware of. My husband assured me that she was, and we were, going to be alright (he was right). We talked to every Aussie owner we could find and read everything we could get our hands on but in reality they are individuals. The best advice that we got and that I can share is to "just love her". I didn't truly understand the advice when it was given to me. It sounded so simple and I thought I already loved her but the best way I can describe it is to be determined in teaching Skylar and patient when she pushes you to see if you're really the leader. They are so incredibly intelligent. If you aren't determined (in a loving way) they will take control and you won’t like it. Luckily we were diligent and it has paid off for all of us. As a breed, they need mental and physical exercise. How much will be determined by Skylar and will certainly change as she gets older. There is so much truth in the saying "a tired dog is a happy dog". Early on playing will be plenty of physical exercise but you’ll quickly want to find mental games, including training, for Skylar (you can find lots of ideas online – both manufactured and homemade). Socialization is also very important. We might have even socialized our Aussie too much (I’m kidding, there is no such thing). Our girl LOVES people, dogs, cats etc. Aussies are known for being protective with their people and aloof with strangers which has caused problems for some owners. Take her everywhere that you safely can and expose her to as many people as you can. Ours loves it when people give her attention and thinks everyone is supposed to love on her. The last thing I can suggest is that she be with you and your family as much as possible. They aren’t a breed that will be content in the backyard. We love our girl more than I can put into words and I’m sure you will love Skylar just as much. There will be trying times but remember to "just love her". I agree with the others about socialization. My 1 1/2 year old female goes to doggie day care once a week. She does well with the dogs there, but we can't let anyone bring their dog to our house. My Aussie is super bonded to me, and my daughter came at Christmas, and my Aussie, would go after her anytime she came near me. We have two other dogs that live with us, and they are ok, however anytime I try and give one of them attention, the Aussie will "heard" them away from me. she is so possessive of me. As for house training, my Aussie, was the easiest dog I've ever trained. she was completely trained within 3 weeks, for going outside. the most remarkable thing was, I tied a bell on our back door, and everytime I took her out, I rang the bell with her paw, and said ring the bell to go pee pee. When she would go outdoors we praised her with a "treat" (a green bean). Three weeks later, I was sitting in the living room and I heard the bell on the door ring, I ran to the kitchen to see her sitting at the door. I opened the door, she ran out and did pee pee. Whenever Dixie has to go out, she rings the bell...she also rings the bell if her water bowl is empty and when she wants dinner. The bell is her way to communicate with us when she needs something. When I first read about bell training, I didn't believe it would work, but we gave it a try and it's the best training tool I've ever used. hello! We brought two babies home. Brother and sister. They were 9 weeks. They were in their kennel when we weren't able to have a watchful eye on them. They are smart and catch on fast! I started the sit training right away. They both got it just a few treats into it! They LOVE being trained and pleasing you! I'm with others out here, socialize them with people and other dogs right off the bat. With two it was hard for us. They were so timid and territorial of our backyard. We still have to remind the male it's ok if someone walks by. It's good to have a little protectiveness it once the owner says stop they need to be ok. Anyway hard to reverse, so have lots of people handle them, have them play with family dogs. Once we started taking them to doggie daycare a few times they've really loosened up. So that's an option too. They are very habit oriented. I swear mine know their eating times. They start whining at me if I'm late feeding them. It's cute. They HAVE to have jobs. Even though we have siblings, they have complete different personalities. The female has to chase a ball a lot or she'll bug you to death. The male just likes doing tricks and guess he considers himself the guard of all of us. He's a sweet boy though. Hope this gives you some good info! Always have something that's theirs to chew on! We always did and to this day they haven't bothered anything in our house that isn't their toy! 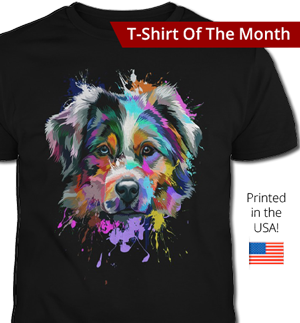 Congratulations Aussies are some of the most intelligent dogs ever they are very energetic dogs and they are very obedient. You have to be patient at first because they will some times nip at your heels. My Aussie loves playing soccer and she loves to go for walks so your dog might like them too. These dogs can also be very picky about their food.sometimes I give my Aussie tuna or salmon that comes in the packets. But that's about all the advice I have so good luck. 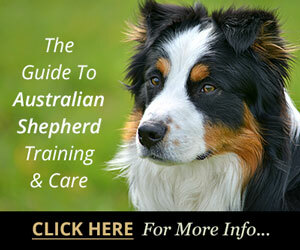 Aussies are terrific dogs SO SMART never under estimate them!!! just like any Pup can get into trouble and they do, just make sure you give them a job and keep them busy, challenge them mentally they love it and LOTS OF PRAISE ... they thrive on it and DO socialize LOTS early to all kinds of critters people and situations, and do not ever give in, they are smart enough to always remember to keep testing you !!!! Enjoy your beautiful new bundle of energy!!!! My guy will be 2 this August and has over 90+ commands he is an emotional support animal for me I trained him myself, and he is still learning, and he surprises me everyday and makes me laugh all the time !!!! 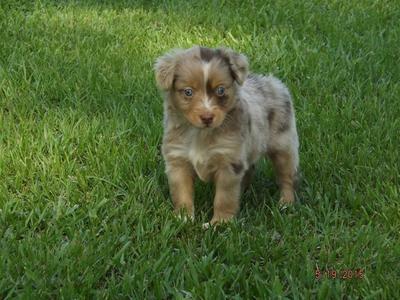 his name is Schooner because he is a blue merle and I was too far from my Blue noser home of Nova Scotia !!! Your puppy is beautiful!! These other comments are very good indeed. I have a 1 year old blue merle female who is super! I brought her home at 9 weeks. You may need a lot of patience because things will not go the way you thought in the beginning. Remember she is still very young. She may try to chew everything (including you), have accidents in the house and jump up and put holes in your clothing with those razor sharp puppy teeth. When mine tried to chew things she should not have I said no firmly and gave her a toy or bone to chew. When she pee'd in the house I would tell her "no, not in the house outside" and bring her to the door and take her outside. If she was outside already I would praise her (use a high pitched voice they respond to that) and show affection. I was told a puppy can hold its urine for however old they are for example, one month equals one hour, 2 months equals 2 hours. I found this to be true. If she jumps turn your back on her and ignore her. She won't like that because she wants you to pay attention to her and play. You'll be saying "no" a lot in the beginning but in the long run you'll be happy you did. My aussie is like my shadow.... follows me everywhere like in everywhere from the kitchen to the living room and all over. She is always by my side. That too took time for me to adapt to. I totally agree with the other comments....socialize her now! Take those walks, go into stores, have her out and about as much as possible. Find a training class in your area. In the long run you'll be glad you did and she will be a better dog. They are so smart, loyal, playful and sensitive. Remember your both getting used to each other. Best of luck!! 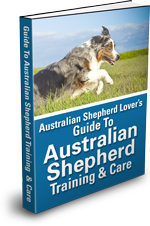 I as well haven't brought my aussie puppy home yet but I have been working with a dog behaviorist already to train me into becoming a great aussie parent. Also crate training will be the best thing for you and your puppy but never put her in the crate as a punishment. She will never forget it and it will ruin all progress with the crate. The crate should be a happy safe place for her where she looks forward to going whenever it's bed time or you have to leave the house. First of all congrats and I'm surviving my first week with my first aussie. Get a spray bottle ready. They are very nippy. This seems to help. Kennel is important as people say. Also if they are overwhelmed with new environments and new people keep that in mind when they are getting used to your home. 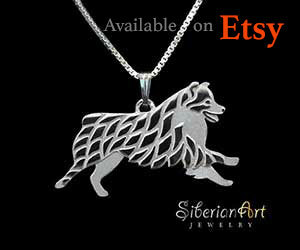 They tend to act out more when stressed and are a sensitive breed. Protect small people from their sharp teeth while you are training them. They seem to prefer one master. This site is great with the advice, and people here really seem to know their stuff. Good luck. Congrats; you will be amazed by the intelligence of this dog breed. I never had a dog until my son had an accident where he was run over by a car while jogging. 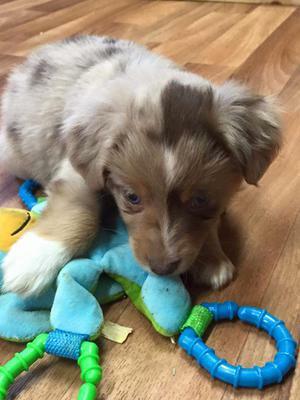 I researched breeds and then found an 8-week old mini Aussie. I put the little guy in the hospital bed with my son and those two bonded. Tommy never had an accident, but we were watching him closely. After about 2 weeks he went to the back door and scratched it so we let him out. Now (6-month later) we have a doggie door that he uses. Tommy is so smart; he knows lots of words and commands. We did not crate train him because there was always someone home. We had him especially trained to recognize and alert us when my son needed medication. After that he was certified as a therapy dog. Getting an Aussie was the best thing we have ever done. Sometimes he is home for hours alone and he has never been destructive. Doors are closed to bed- and bathrooms; he has access to living-, dining room and kitchen. He can go outside through the doggie door. When it rains and I put a towel on the wood floor, he knows to come inside and stay on the towel until one of us dries off his paws. I'm so glad I got to tell my story - you will love your Aussie!